Where did I leave off? Oh that’s right, we were about to board a bus to Chiang Mai…a journey that taught us a few very valuable lessons – 1) It always takes longer than they say it will, and 2) Always carry toilet paper with you, for those times when you stop at 1am at a public bathroom (the kind that are just a hole in the ground) and y’know, loo paper might come in handy. We arrived early on Thursday morning and headed straight to our hostel, Trekker Camp, just south of the old town centre. It wasn’t as nice as the photos online had made it look, but it was a room and a bed, and to be honest, what more can you expect for 50 baht a night (around £1.50)? 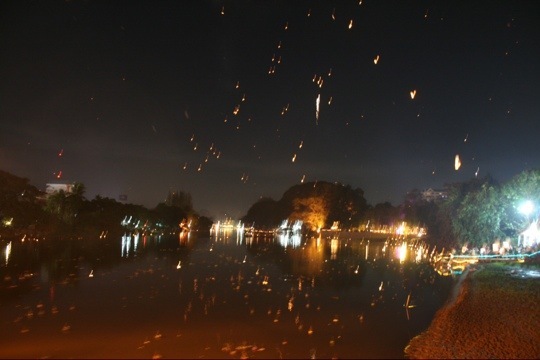 We dumped our bags, showered and changed and then, after a quick nap, headed out to the main city to take part in the lantern festival, Loi Krathong, that we had conveniently arrived just in time for. Our hostel hosts had kindly taught us how to make and decorate the floating candles that we later placed into the river along with other tourists and locals alike. 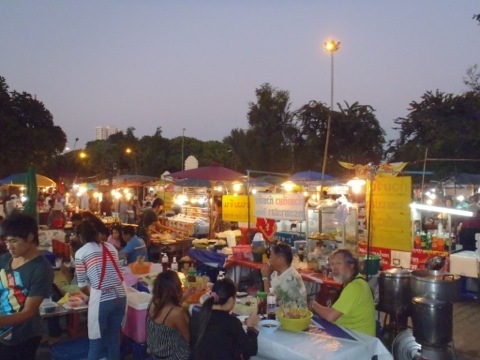 As we explored the town and the markets and food stalls that night I realised that the culture shock I felt upon entering Bangkok from London pales in comparison to that of the differences between Bangkok and Chiang Mai, in northern Thailand. Where the former is smoggy and humid, the latter is clear and bright. Where Bangkok is brash, loud and arrogant, Chiang Mai is calm and unassuming (although it really comes alive at night). What’s also different to Bangkok is that the locals here barely speak any English, making for an interesting guessing game when ordering food, or bartering on prices for taxis or in the local markets (including the awesome Saturday walking market, when they close the street to all cars). On our second day Chiang Mai we rose early and headed to the north of the city in one of the red sawngthaew taxis to the Tiger Kingdom we’d been told about by two girls from New Zealand that we’d met on our bus journey the night before. 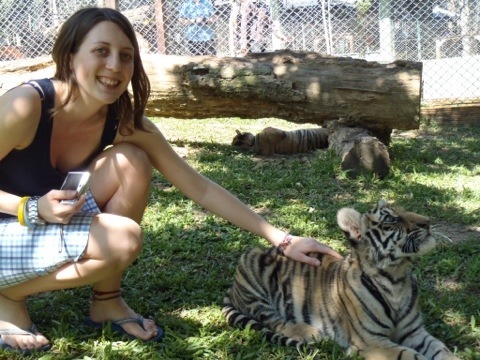 Playing with the tigers (we chose the small size, roughly 5 – 7 months old), was one of those awesome yet strangely surreal moments in life when you can’t quite believe what’s happening. They were so ridiculously cute we were trying to come up with a plan to sneak one away with us in our bags…Bucket List number 25 complete! Of course we also ventured to a couple of the city’s famous temples, including Wat Chiang Man, and the incredible Wat Phra That Doi Suthep, that sits on top of a mountain and is one of the north’s most sacred temples. The views from up there are astounding and the temple itself is absolutely breathtaking…although that may have had something to do with the gazillion steps we’d just climbed to get there! From here we’re heading to the city of Phitsanulok, about a 6 hour train ride away, for a few days and from there we’ll make our way to Laos and onwards. The journey has only just begun.